« Can we stop already? …blue dots indicate active applications. Icons that don’t have blue dots are in the Dock because I use them frequently, so I’ve dragged them in there for easy access. 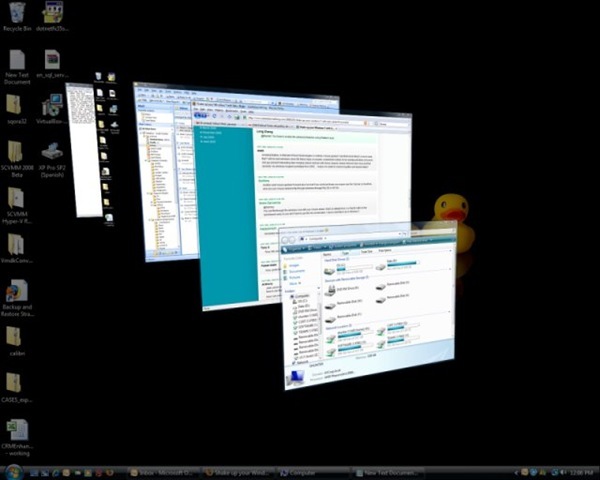 Command-Tab switches between running applications, like Alt-Tab does in Windows. The missing piece is this: Mac OS X applications are typically MDI, where one instance of the app manages multiple document windows. In other words, you have one instance of Microsoft Word — many documents open in it, perhaps, but all owned by the same process and corresponding to the same icon in the Dock. There isn’t a 1:1 mapping between document and application. Windows applications are typically SDI and host each document in a separate process. Five Word documents means five icons in the taskbar. Whether this is better or worse is a matter of personal preference. Since clicking on application’s icon in Mac OS X doesn’t mean switching to a given document, Expose lets you quickly get between them. There’s also Command-Tilde to cycle through all documents in the current application. Anyhow, I was on an OSX-based Mac today with several applications open, but I *NEVER* noticed any such blue-dot denotions of currently opened apps. Hmmm. Regardless of the MDI/SDI differences between Mac and Windows, my point still stands: the Expose feature really solved an issue that Macs have, and Windows does not. OS preferences aside, having an Expose-like interface in Windows would be nifty and all, but would really solve nothing — aka the “Flip 3D” view that I am bemoaning. It’s helpful in the OSX world — I’ll grant you that — but not on Windows.